TL;DR Trying to find out exactly what custom audiences are and how to create them can be taxing. That's why we put together this guide with complete information on custom audiences in one place so that you don't have to jump from page to page to find all of the pertinent information you need. 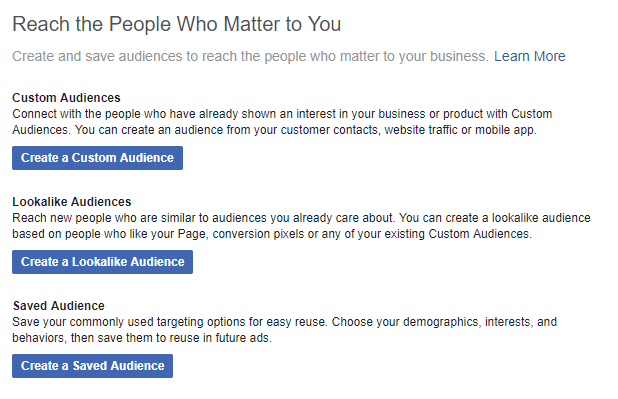 If you have ever used Facebook then you have heard of custom audiences before. They are the marketer’s secret tool to reach the people that you need on Facebook, by matching them using Facebook pixel,email adresses, telephone numbers or other means. This means that you have more of an opportunity to reach the right people that you need to reach directly. This is also a great way to target the people that are most relevant to your business goals. If, for example you wanted to target people that were going through your online store and visited a certain category of products that you want to promote, you could do that with website custom audience. All you would need to do is set up a pixel for that event and run ads specific to those group of people. No more broad targeting, with cutom audiences, you can make sure that your ads have an impact because they target the right people with the right message. This is a comprehensive quide, so feel free to jump to specific parts of your interest: types of audiences, best practices, making a custom audience, potential problems, data security and automation. These are the audiences that you create based on the list of contacts that you already have. Ads can be shown to your custom audiences across Facebook, Instagram and Audience Network. Website custom audiences are those audiences of people who visit your website or specific pages on your site. If someone comes onto a specific page on your site that has a promotion that you want to push then you can use that list of people and push Facebook ads to those people. In order to use website custom audiences you will need to have a Facebook pixel implemented on your page. Pixels are pieces of code that can help you measure the effectiveness of your campaigns. You will have to install your pixel on Facebook in the header of your website. Facebook has undergone some changes with their pixels. In order to create one, in ads manager go to the Pixels tab and click on create Pixel. You can then create events for specific actions that you want the pixel to measure. These are from on your CRM or other list that you collect. If for example you have a newsletter that you send through your CRM for a specific event or sale then you can upload that list and advertise to those users who are on Facebook. These are people who downloaded and interacted with your app. You can create the rules for these audiences such as if they reached a certain level, made a certain amount in purchases and more. In order to use this, you must include and SDK for iOS, Android and Canvas. You can find people who interacted with your business such as through a sales call, or customer relationship-based phone conversation, those who visited your store and more. 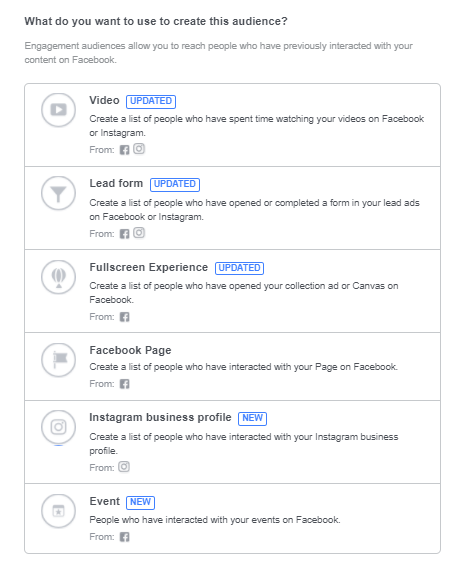 Find users who interact with your brand on Facebook via videos, lead forms, people who opened your collection or canvas ads, interacted with your Facebook page, interacted with your Instagram business profile, or people who interacted with your events. First thing that you need to get is a list of audiences. Here are few of the best practices for making your audience list. Have as much information as possible about your contacts. That will give Facebook the highest probability of matching your audience list to the list of users. Some data fields include: dates, email, dates of birth, Facebook user ID and more. A full list as well as how Facebook wants you to format that data can be found here. Make sure that the information you have is formatted in the way that Facebook will be able to recognize, increasing your chances of matching your data with Facebook’s data directly. Go to Business Manager (https://business.facebook.com/) and hover over the “All tools” link. From there select Audiences. Under the “Create New” tab click “Create a Custom Audience” if you do not have one prepared. Under “Use a Saved Audience” click “Create a Custom Audience” if you already have one prepared. Add your own file. This can be done as either a .txt or .csv file. Choose the pixel that you want Facebook to collect information from. Set the rules. You must start with an inclusive one and can have up to 5 rule sections. Give your audience a name. Choose the event that you want Facebook to collect information from. Choose how far back you want Facebook to collect the app event. Refine your audience on parameters such as only including people who purchased over a certain amount in your app. Click “Create Audience” to finish. Choose the offline events sets you want to create the custom audience for. Choose the Facebook content type that people interacted it for which you want to make a custom audience. Follow the prompts according to whichever you want to make and audience for. Sometimes you might name things in a different way than Facebook does and that’s ok. You won’t need to completely change your system. After you have uploaded that file to Facebook, will ask you map your data. The green check mark means that Facebook understands what you mean by the particular data set. Always double check though. The red warning sign means that Facebook knows what it means but that the formatting is wrong. To save time, double check Facebook’s formatting before you upload. Facebook hashes the information that you provide. Hashing makes sure that you and your customers can rest assured that their information remains private. The data you provide is hashed locally on your computer before being sent to Facebook. Sometimes you might need to manually upload your customer lists. For example if you have a list of customers from your CRM that by a particular amount then you will need to constantly upload that information. Unfortunately, Facebook does not have a solution for this. One option would be to estimate the best times to make these updates. But this might mean not being able to react quickly enough. At ROI Hunter, you can micro-target from your CRM and automatically update information from your CRM to save you time. Facebook custom audiences can be very helpful in reaching helping you to reach your business goals. This is because it helps you to refine your targeting and make sure that you are reaching the people that you want to reach. More importantly, you can make sure that you target your audience with refined messages. If you know that you want to reach people that have shown interest in a particular campaign because they clicked on certain pages on your site, then you can target those people with a message that is refined to them asking them to complete the purchase. 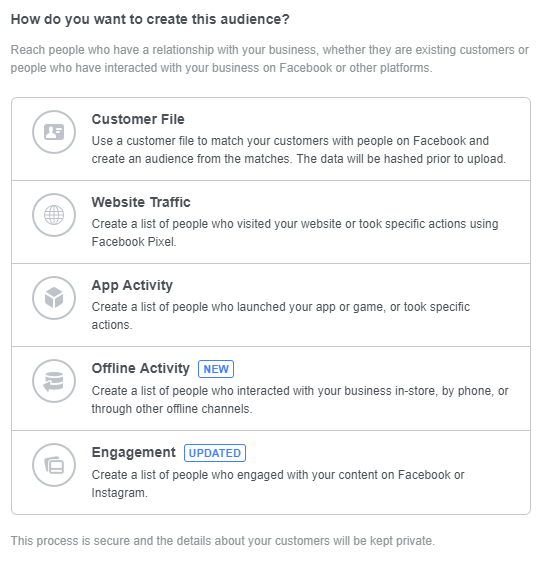 Essentially, custom audiences are lists of contacts you already have and want to show them ads on Facebook, Instagram or Audience Network. It is possible to create a lookalike audience from custom audiences as well. Lookalike audiences help you to extend the reach of your campaigns by showing your ads to people who are similar to your current audience. That’s why having as much information as possible is crucial to custom audiences.